OGHS preps for "This is Me!" OTTAWA — The 25th annual Ottawa-Glandorf Dinner Theater, “This is Me!” will be another sensational production. Current members of O-G’s show choir, “Out of the Blue,” Ann Samuelson, Natasha Valdez, and Isaac Compton, spoke about this year’s dinner theater, as well as the impact their instructor, Mr. Ted Ellerbrock — who announced he will retire at the end of this academic year — has had on their lives. The trio of seniors had different reasons for becoming involved in the musical arts. Ann had grown up with music; her mother and grandmother had a big influence on her. Natasha had a musical background, as she took dance lessons. She and Isaac were both members of the Putnam County Children’s Theater. 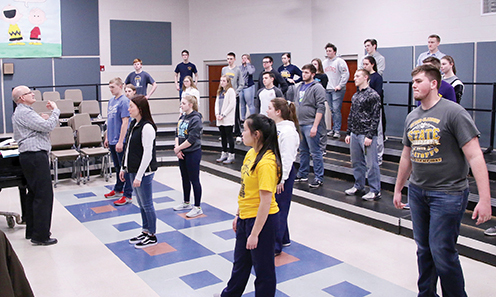 Isaac recalled seeing the OGHS Show Choir perform when he was a student at Sts. Peter and Paul School. “I thought, ‘How cool was that,’ and wanted to pursue that,” he remembered. Natasha and Isaac are both performing solos and are members of the chorale, but their favorite songs are ones they will sing as part of “Out of the Blue.” Natasha chose “Sit Down, You’re Rockin’ the Boat,” from Guys and Dolls, as her number one pick. “I had my struggles with the dance, but it’s growing on me,” Natasha confided. Isaac selected “He Lives in You” from The Lion King. The dinner theater will be held in the OGHS Robert J. Hermiller Gymnasium on Friday, April 5 and Saturday, April 6 at 6:30 p.m. On Sunday, April 7, the performance will begin at 4:30 p.m.